Cynosure (formerly Enticement) is for sale - check out the ad below that Tom posted on Craigslist. Eric Varty (Canopache, Yankee # 188) stopped in to see her and reports she really needs to find her new home soon. A few of the photos he took are below. This ad was up on Craig's List. I spoke to Tom - he said that he acquired this boat in a business deal. She sailed on Long Island Sound out of West Haven and New Haven, CT. Your webmaster has additional information and photos and, if interested, please get in touch (ronbreault@dolphin24.org). One of our missions is to save Dolphins! The ad was up at http://newhaven.craigslist.org/boa/836700697.html and has since expired. 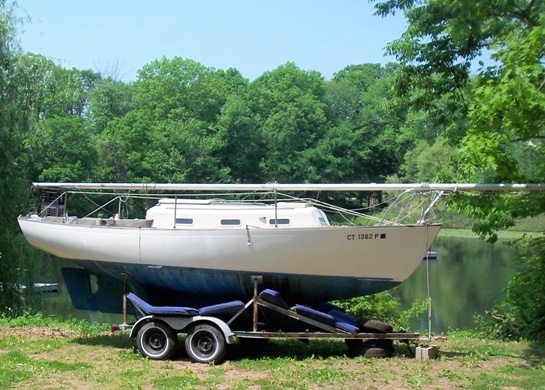 Reply to: sale-836700697@craigslist.org Date: 2007-05-23, 11:21PM EDT 1962 24' O'Day Dolphin Sailboat. 1 of only 36 ever built. Hull in great shape. Sleeps 5. 8hp Palmer inboard (gas) engine. Head with holding tank. 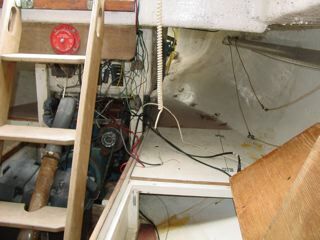 Garmin fishfinder, VHF antenna (radio needs repair), compass, 2 Danforth anchors with line and chain, PFD's, fold-up swim ladder, cabin bench cushions. 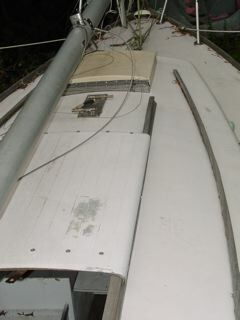 Sails included: Genoa, older & new (5 years) mainsail, spinnaker, jib needs repair. 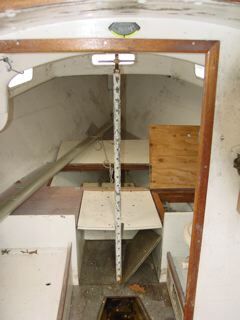 Needs new shaft and propeller, spreaders, & tiller. Has been out of the water for 3 years. Standing rigging good, running rigging untested. 4-wheel trailer included. $4500 obo. A little "spit an' polish" will make this a beautiful boat for a long time! Call 203-804-4810 (5/11//2009 - no longer correct phone number - new number 203 699 8013, We are trying to re-establish contact) and ask for Tom.